Timing wise, some things work out better then others. This turned out to be one of them. On an aborted trip to Kelly Flats my transfer case decided it no longer wanted to be part of the team. Nasty cracking and popping noises followed by some not very nice whirring and clunking and complete failure of the ability to shift into 4-wheel drive. Not as catastrophic as it could have been, but still pretty bad. At least I got it home under it's own power. I had two outstanding transfer case related tasks. 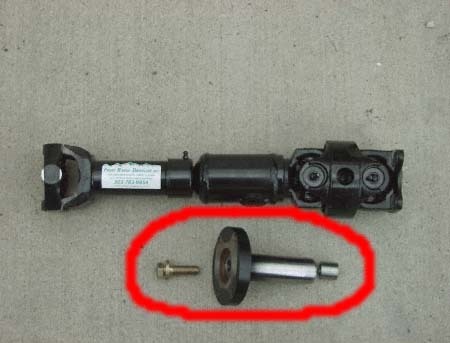 One was the conversion to a fixed front output shaft yoke (see picture to the right) for the Mitsubishi transfer case. The other was installing the new deeper ratio transfer case gears I purchased this spring. Besides, these two outstanding things I now I had a dead transfer case to fix if I wanted to continue driving my Sport. I decided that the present was a good time to wrap all three into the same package and get everything resolved at once. So, I started pricing transfer case parts for a rebuild. Not really knowing exactly what was wrong with my existing transfer case it was kind of a 'price out the most common things to break in a transfer case' attempt to come up with a ballpark dollar figure. This attempt resulted in severe sticker shock! I found out that just a rebuild was going to cost in the $1000+ range - very close to the price of a new transfer case from the Mitsubishi dealership. My other problem was that everyone wanted several days to get the parts and do the rebuild and no one was too tickled about installing aftermarket gears. Since I use my Sport as my daily driver 'several days' was not an option. So, I started surfing the 'Web for used transfer cases. What I found was a lot of transfer cases for the automatic transmission based vehicles but not very many for the five-speed transmission based Sports. No problem. I only needed one! I finally located a transfer case in Virginia from a wrecked 1997 Sport with 91,000 miles on it. A few questions allowed me to determine with relative certainty that the Sport had never been used off road and probably hadn't been put in 4-wheel drive more then a dozen times. Since most of the stress and wear and tear on a Mitsubishi transfer case comes when it's in 4-wheel drive for me that was an important determining factor in the purchase. I didn't need another transfer case I'd have to rebuild. 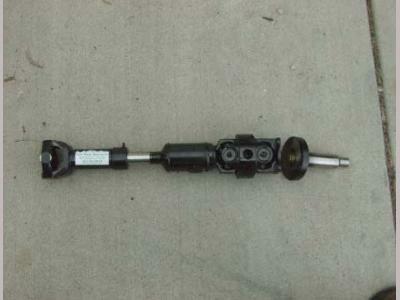 A great perk to this purchase was that they still had the front output shaft yoke and drive shaft. I didn't need the factory drive shaft but the yoke was needed to do the fixed yoke conversion. So, for about $560 including shipping they packaged everything up and shipped it out; in two days I received a call that the delivery company was ready to drop the whole lot on my doorstep. The transfer case showed up intact with the shifters, front output shaft yoke and drive shaft. On the same day I'd ordered the transfer case I called the Mitsubishi dealership and ordered all the gaskets I'd need for the rebuild. I ordered a new transfer case PTO cover gasket, transmission to transfer case gasket, shifter mount plate to transfer case gasket and a lower gasket each for the transfer case and transmission shifters. I also ordered new output shaft seals for the front and rear shafts and a new seal for the transfer case main input gear. It didn't take long for these to show up at the parts counter. I still had one thing left to pick up, though. I needed - and Autozone kindly supplied this - a tube of Permatex semi-hardening grey silicone gasket maker. According to Permatex it's made specifically for import automobile parts where 'form-a-gasket' is used in place of real gaskets. As far as I can tell it works as well, if not better, than the factory grey gasket maker (I have yet to have any leaks). Now that I had the transfer case, gaskets, sealer and yoke it was time to tear it down and remove the front output shaft. The plan for the fixed yoke conversion was to drill a �"x20 hole in the end of the shaft and then modify the factory yoke to allow for a bolt through the center of the yoke into the output shaft. Excellent plan in theory, but somewhat more complicated to implement in reality. The output shaft is case hardened and requires cobalt drill bits and a special tap for threading the hole. It also requires someone with experience in drilling and taping extremely hard materials. Thankfully, the company that was preparing the new driveshaft had a lead on another company that could do the work. And they did. I dropped the output shaft off in the morning and by 4:00 in the afternoon it was drilled, taped and ready to go. After a quick stop at Ace Hardware to acquire a 2"x20 grade 8 bolt and 1/8" thick hardened steel washer I was ready to start. The first step was to remove the dead transfer case from my Sport. After draining all the fluid from the transfer case I detached all the electrical wiring from the transfer case and removed the ground strap. Next, I moved to the cab and removed the console assembly so I could access the shifters, the one or two electrical connectors I couldn't reach from underneath and the vent tube assembly. I unbolted the shifters from the shift mount plate and then removed the shift mount plate. The shift mount plate must be removed to give access to the manual transmission shift rod and the small socket/lever assembly the shifter ball fits into. Once the shifters and shift mount plate were removed I tapped the roll pin out of the shift lever, letting it drop into the transfer case (since I was rebuilding the entire transfer case it really didn't matter - I'd get it back eventually). That all done I unbolted and removed the front and rear drive shafts. After everything was disconnected and/or removed from the transfer case the next step was actually removing the t-case from the vehicle. I highly recommend having a transmission jack for this step. The transfer case weighs in at about 100 lbs. so this is not something you'd want to slip off a regular jack and have fall on you. Removal of the Mitsubishi transfer case is made harder by the shift rod extending from the transmission into the transfer case. The transfer case must be slid STRAIGHT back several inches (about 4-6") before the transfer case can be lowered. If you break or bend the shift rod the transmission will have to be removed from the vehicle for repair. Now that the old transfer case was out of the vehicle it was time to rebuild the new transfer case with the new gears and modified output shaft. There are a few little 'gotchas' in this process. Most are Mitsubishi's but one is caused by the larger diameter of the new gears. The solution - more or less - to the Mitsubishi issues is to have the factory services manuals present. Previously, I've found the factory manuals to be notoriously vague in the most awkward places - no difference here. The issue I had with the service manuals in this instance was in replacing the 4-wheel drive hi-lo shift rod. The diagrams are very poor. I assembled the entire transfer case several times before I finally figured out - mostly by deduction - that the rod fit differently then it looked in the diagram in the manual. I eventually ended up matching the 4-wheel drive hi-lo shift rod with an opposing shift rod. Thankfully you can bench test the transfer case functionality by installing the transfer case shifter (not the transmission shifter) and cycling the transfer case by hand. The second and third issues are related to the new gears. Second, one of the three new gears replaces the factory gear on the end of the gear cluster shaft; it is significantly larger in diameter than the factory gear. The new gear must be slid into the case through the PTO opening and held in place while the main shaft is lowered into the case and the shaft slips through the new gear and into the main drive gear. 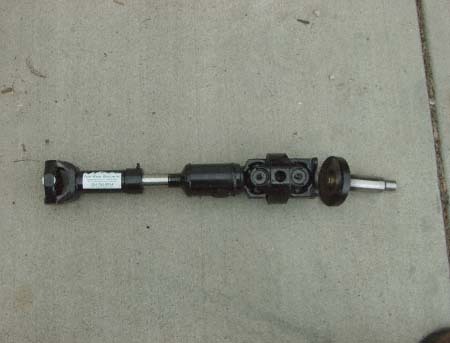 The front output shaft, drive chain and gear cluster shaft must be installed as a complete unit. This is very awkward and while I did it by myself I recommend having a second party assist. The complete unit is heavy and awkward and the edges of the aluminum case are very sharp around this area; trying to do three things with two hands doesn't allow for much finesse. You can get pretty sliced up trying this by yourself. Third, when installing the new 2.85 gear set the snap ring that retains the gear on the main gear cluster shaft cannot be reinstalled. As mentioned above the gear must be installed on the cluster shaft from inside the transfer case. Once the shaft and gear assembly is installed in the transfer case there is no way to reinstall the snap ring on the cluster shaft. However, once the transfer case is completely assembled the gear is held stationary on the shaft between the main input gear and the rest of the gear cluster assembly so there are no mechanical issues. At this point there where one or two things to note regarding the form-a-gasket sealer. Before applying the form-a-gasket to the main case halves I recommend test assembling and cycling the transfer case once or twice. This takes a bit more time but hopefully will prevent ending up with a big mess if you have to tear the transfer case down after having applied the form-a-gasket. A second and VERY important thing concerns the tail shaft housing. There are two large oil passages that feed oil from the main housing into the tail shaft. Both of which I found completely blocked on the new transfer case by form-a-gasket when the transfer case was assembled at the factory. Make sure when applying the form-a-gasket that the two passages are not blocked by sealer squishing out from between the tail shaft housing and the main case - apply the sealer lightly. With the exception of the issues noted above assembly of the new transfer case proceeded according to the documentation in the factory manuals. Now that the new transfer case was complete it was time to install it back in my Sport. The transfer case was set on the jack and then lifted into position. Note: The transmission and transfer case shift lever mount plate is NOT installed at this time since you must have access to the shift assembly inside the transfer case for the following steps. Once in the tunnel I guided the transfer case onto the shift rod with direction from an assistant in the cab and slid the transfer case forward a couple inches towards the transmission. Once the shift rod was accessible inside the transfer case my assistant slid the transmission shift lever onto the shift rod and I finished sliding the transfer case into place, installed the transfer case mount bolts, reconnected the ground strap and all the wires I could get to from under the vehicle. From inside the cab I reinstalled the roll pin in the transmission shift lever, the rest of the electrical connectors, the transmission and transfer case lever mount plate, transfer case vent tube and both shift levers. I was very careful when reinstalling the wiring to make sure they were correctly routed and weren't accidentally stretched too tight. The engine, transmission and transfer case assembly move around considerably when off road in 4-low and I didn't want to suddenly find myself with a dead vehicle because of a broken wire. The rest of the in-cab work consisted only of reinstalling the console assembly, a new shift lever boot - the one that seals the body, not the one you see in the cab - and the shifter handles. Test shifting the transmission and transfer case to make sure everything was still working correctly and general clean up. Now I was ready to complete the final few steps. Back under my Sport I reinstalled the rear drive shaft. I made sure and lubricated the outside and splines of the rear yoke well before installing it into the transfer case. The next step was to install the new fixed yoke on the front output shaft. After lubricating the outside and the splines of the new yoke with synthetic gear oil I installed the new spacer inside the yoke and slid the assembly onto the output shaft. I applied a thin layer of the gray form-a-gasket to the face of the steel washer facing the yoke and applied Loc-Tight to the bolt. I then fit the bolt through the washer, threaded it into the output shaft and torqued the assembly down. At this point all that was left was to bolt the new front drive shaft into place, double check all the bolts and electrical connections, double check all the clearance between the new drive shaft and transfer case support and fill the transfer case with Amsoil full synthetic gear oil. With everything checked out and the transfer case refilled it was time for some testing. First on the list - test for vibration in 4-wheel drive high. Prior to the install of the fixed yoke it was impossible to get above 20 MPH due to extreme vibration caused by excessive play in the front yoke/output shaft assembly. The fixed yoke completely eliminated this up to 55 MPH where I stopped the test. No increase in noise or vibration was noticed in either 4-wheel drive hi or low. The next test was of course the most fun. The trail test! Going from a transfer case gear ratio of 1.92 to 2.85 may not seem like much on paper but it makes a HUGE difference in off-road performance. With the new gears the crawl ratio of my Sport went from 40.7 to 60.4! Again, this may not sound like much on paper but I can now crawl up and over obstacles at a bare fraction of the speed my Sport would previously. In fact, second gear in 4-low now feels like first gear in 4-low formerly did! And, going down hill even on extremely steep inclines very often requires I press on the gas to keep my Sport from stalling. Very different from having to ride the brake in 4-low even on moderate inclines. For trail testing we choose Silver Creek, not too far outside Denver, and the Red Cone/Radical Hill/Georgia Pass loop. Silver Creek is probably the most technical trail within 30 minutes of Denver. The trail includes a very steep, sand covered and somewhat off camber 30' slick rock climb as well as a rock shelf climb followed by a 90 degree turn including rock/hole combo. The Red Cone/Radical Hill/Georgia Pass loop doesn't include any slick rock but has several steep, mogul ridden up and down hill loose dirt and shale sections. This trip everything after Red Cone was also soaking wet due to an early August snowstorm. The reduction in gearing made short work of both trail runs! The huge reduction in speed in 4-low 1st gear allowed for precision in steering that was previously impossible even at 800-900 RPM. The reduction in gearing also made it unnecessary to use the 'velocity method' on the steep slick rock shelves and climbs. So, overall I give the gears and fixed yoke conversion a enthusiastic thumbs up!